Kentucky Power presents a $61,160 AEP Foundation grant to Letcher County volunteer fire departments. 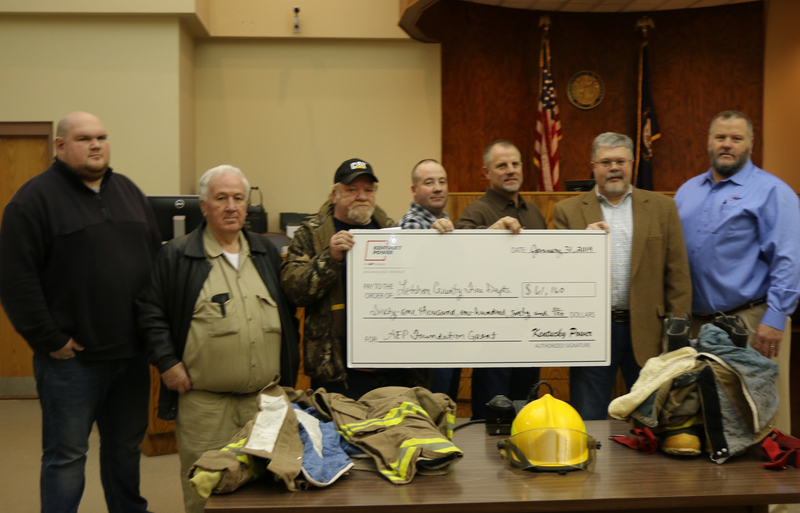 WHITESBURG, Ky. – Kentucky Power on Thursday awarded a $61,160 American Electric Power (AEP) Foundation grant to Letcher County’s eight fire departments. The grant will be used to purchase 40 sets of turnout gear for Colson, Cumberland, Gordon, Kingscreek, Letcher, Mayking, Neon and Sandlick fire departments. Each department will receive five new sets of the personal protective equipment and will contribute $2,035 for boots, helmets and gloves. The local contributions combined with the AEP Foundation grant will fund new gear totaling $77,440. Mike Amburgey, chief of the Sandlick Volunteer Fire Department, said in the grant application that National Fire Protection Association regulations require new gear every 10 years. The rise of methamphetamine use has contributed to the need for new equipment more frequently than in the past, he said. The AEP Foundation is funded by AEP and its operating companies, including Kentucky Power. AEP Foundation grants are not tracked for recovery from customers through rates. The Foundation grants focus on improving lives primarily through education in science, technology, engineering, math and the environment and by supporting basic services, such as shelter, housing, health, safety and hunger. In awarding grants, Kentucky Power gives priority to organizations serving 168,000 customers in 20 eastern Kentucky counties served by Kentucky Power.